For the purpose of this article we are just going to explain 3 of the key terms relating to the phases which we will be discussing at a high level. Agile marketing executes and achieves it's objective's in short time boxed periods. This is one of the key ways in which agile marketing differentiates itself from other marketing methodologies. These time boxed efforts are called Sprints. The duration is fixed in advance for each Sprint and is normally between two weeks and one month (with two weeks being the most common in my experience). Once you execute a few sprints you may find that they are either too long or too short. If you hit this problem then review it and change the sprint length and see how you get on for the next few sprints. A User Story is a high level requirement. It is something that a visitor, lead or prospect wants to accomplish. They help you get customers through the buying process (or journey) by helping you to identify and address their needs. They help ensure the marketing team has a thorough understanding of what the potential customer wants to achieve and the information that they need in order to do that. "As a _________, I want _________, so that _________." "As a marketing manager I want to learn more about marketing metrics so that I can improve our reporting to our CMO and C-Suite by using hard facts and figures to justify our annual budget requests"
"As a CMO I want to be able to implement, track and measure all our marketing campaigns using one tool so that it is easier to review the results from landing pages, email, social media etc via one dashboard rather than having to manually extract and collate data from a number of different sources and tools." "As a business owner I want to generate more leads so that I can increase revenue and grow my business"
A user story is broken down into the tasks required and not all tasks may be completed in one sprint i.e. the user story may be addressed over a number of sprints. It takes a bit of time to get used to writing user stories but once you get some practice, you will see huge benefits. A backlog is a list of user stories and related tasks which need to be completed. The backlog will be a 'living' list that grows as product/service offerings change, your leads, prospects and clients needs change, trends change etc. The backlog is the primary point of entry for knowledge about what you need to complete and the single authoritative source defining the work to be done. Using a tool like JIRA will help you manage and track the stories and related tasks in your backlog. The backlog is usually maintained by the marketing team but you can give access to other stakeholders to add new stories if you wish. 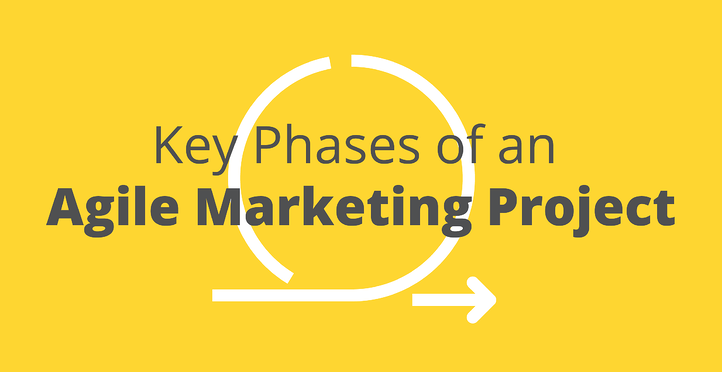 So now you understand a a few key terms which we will be referring to, what are the key phases of agile marketing projects? Note that some people start with the backlog update rather than finish with it - whatever works for you. Each sprint needs to be carefully planned including goal setting so that you can measure the results at the end of each sprint. Before planning a sprint you need to decide on the number of resources available to work on the sprint. If you decide on a 2 week sprint and you have 4 people on the team then you have approximately 320 hours for completion of your marketing tasks (based on 40 hour week). You should deduct at least 10% of that for unforeseen tasks (i.e. contingency). You will probably find that you need to allocate more than 10%. Try it out and see how you get on then you can change the contingency allocation accordingly. So taking contingency into account, let's say you have 288 hours available across the 4 resources for a 2 week sprint. The sprint planning meeting will have each 4 team members along with key business stakeholders and a scum master (the person who runs the meeting and the Sprints - generally the agile marketing project manager). All of the people present at the meeting will decide on a goal for the sprint and choose what stories they feel are high value and can be achieved within the sprint that will help them achieve their sprint goal. The meeting will generally take up to a couple of hours to complete but can take longer. The more experienced you become the shorter the sprint planning meetings will be. At the end of a sprint planning meeting, you should have a board with a list of tasks all under a “to do” column. 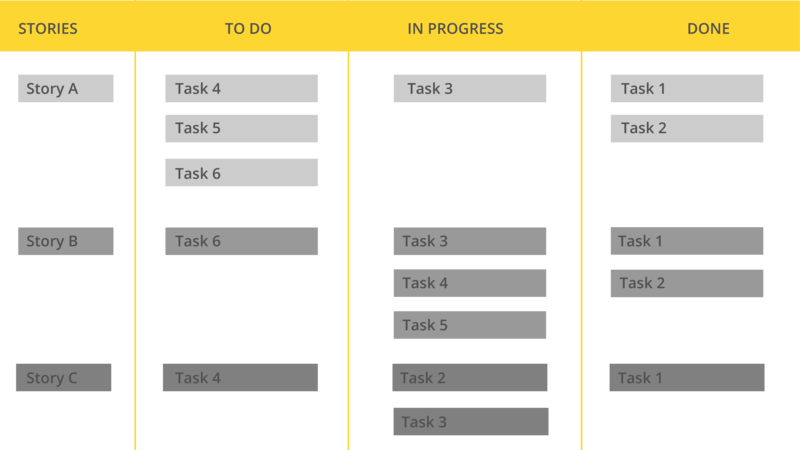 As the sprint progresses the tasks will move from “to do” to “in progress” to “complete.” This board may be a whiteboard with post-it notes for each task or you may use an electronic board like JIRA provides. The following is an illustration as to how the board (electronic or otherwise) might look during the sprint. At the end of the planning meeting all stories will be in the first column and the tasks in the second column - 'To Do'. Sprint execution starts after the sprint planning is complete. It is where the sprint team starts working on all tasks allocated to them in order of priority. A key part of sprint management is the daily 'scrum' or 'stand up' meetings. Do not let the team sit down during your daily scrum unless you want it to take longer to complete! Daily scrum meetings need to be tightly managed by the scrum master (generally the project manager). The scrum master needs to ensure that the team quickly communicates issues etc. and keeps the meeting to 15-20 minutes max. Results of the Sprint - did the sprint achieve it's goal? Don't allow more than 2 hours for this meeting - 1 hour should be sufficient. No formal presentations are allowed - so no MS PP or Keynote presentations please! You may decide to extend an invite to this meeting to people beyond the team and the key stakeholders to improve communication across relevant business units. It's very important to note that even if not all items were completed in the sprint the key focus should be on whether the sprint achieved the goals set out at the planning meeting at the start of the sprint. 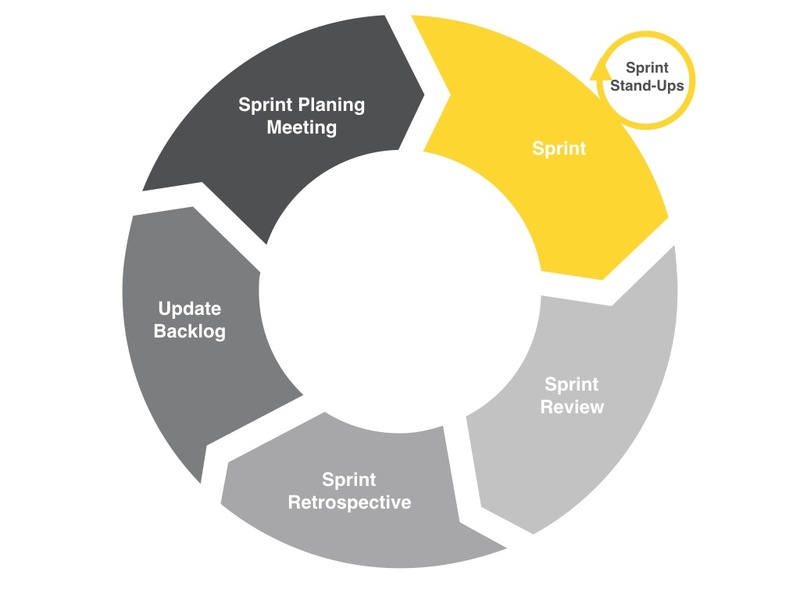 Once you have completed this review you may make changes to how your next sprint will work based on these discussions. After the Sprint Retrospective you generally update your backlog and move straight to planning for the next sprint. Your backlog is a 'living' list of user stories. At the end of each sprint you need to update your backlog based on whats been completed as part of the sprint as well as adding any new user stories or tasks. It's good practice for the marketing manager and/or the sprint scrum master to keep the backlog up to date on a regular basis but in case they don't, now's the time to update it ahead of the next sprint planning meeting. Agile is a great way to work smarter, remain flexible and become more in tune to your potential and existing customers needs. If you decide to take this approach then tailor the process as you gain experience so that it works well for you and gets the best results for your organisation. Execute your sprint and include 15 minute daily stand-up meetings - no longer than that! Review your sprint and consider increasing your list of attendees to improve communication - it's not just for managers and the sprint team! Complete a Sprint Retrospective with the team to get feedback on how it went, learn from it and improve your process. Remember....Success is achieving the sprint goal, not just delivering all the stories or tasks you had planned to get done. I hope this has given you enough insight as to what the key phases of an agile marketing project are so that you can decide if you want to look into it further or adopt it as a process for your company. Feel free to contact me on sinead@webjourney.ie if you have any questions or experiences with agile that you would like to share - we'd love to hear about them. 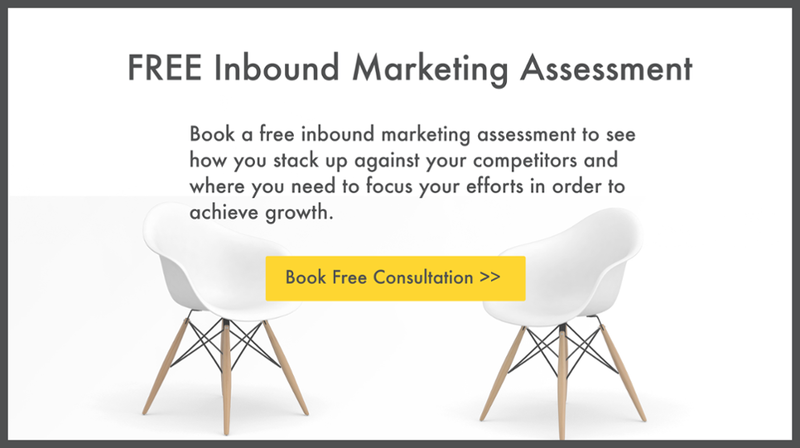 If Agile marketing is something that you are considering but you need some additional guidance on how to go about making that change then sign up for a FREE Inbound Marketing Assessment to review your current marketing tactics and see if you are a good fit for agile. Just click below to arrange one.